Tripp Lite's HT706TSAT Home/Business Theater Surge Suppressor provides high-performance protection--2100 joules--stopping damaging surges and filtering disruptive line noise so components perform at their peak! You can see and hear the difference: sharper, crisper video; deeper, fuller audio and longer component life spans. Perfect for small home/business theater installations: high-definition TVs, satellite and A/V receivers, DVD/CD players and more. 7 outlets (with transformer spacing), 2-line coaxial protection and 1-line tel/modem protection safeguard an entire home/business theater system. $100,000 Ultimate Lifetime Insurance coverage (USA and Canada only). 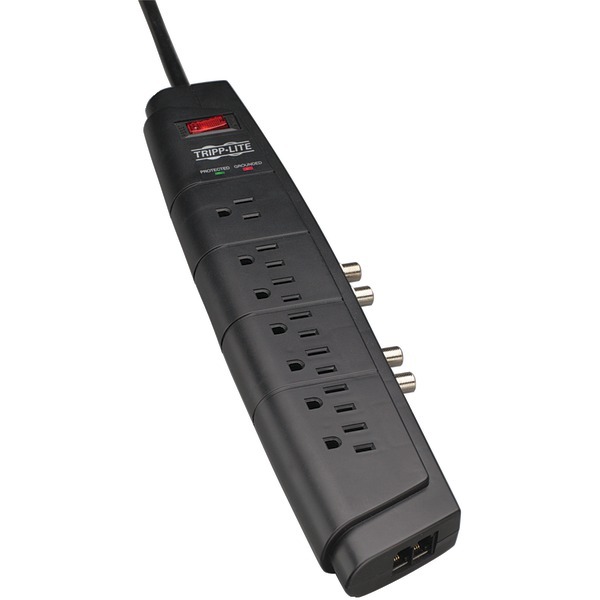 Includes two diagnostic LEDs, 6 ft. cord with a right-angle plug, 6 ft. coaxial cable and 6 ft. phone cord.